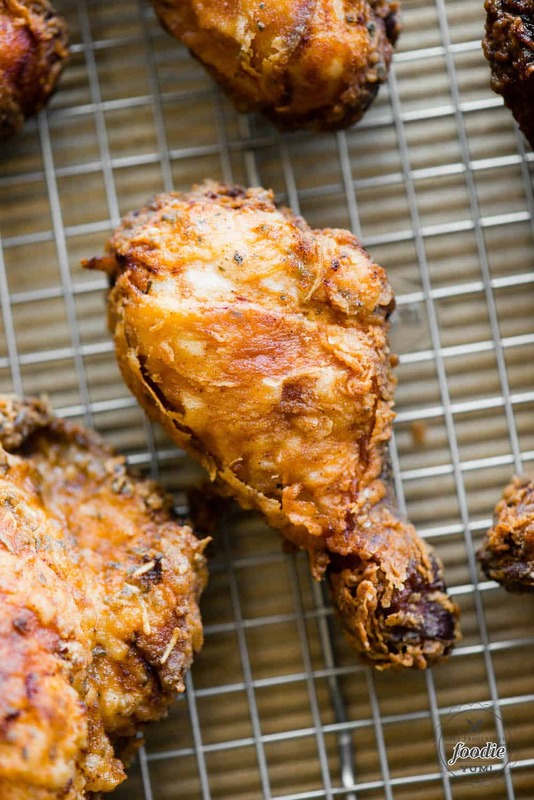 Buttermilk Fried Chicken is the ultimate comfort food! Bone in, skin on chicken is soaked in a buttermilk brine, coated, and fried until golden and crispy! 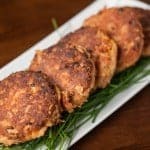 Pin it to your CHICKEN RECIPE BOARD to SAVE it for later! Buttermilk Fried Chicken is one of those finger licking comfort foods that everyone loves but not everyone cooks. 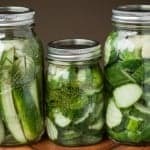 There is a fair amount of time, labor, dishes, and oil involved when making this Southern favorite, but each tasty morsel will make you smile. When making homemade buttermilk fried chicken, you can’t go wrong with some Brown Butter Mashed Potatoes and Collard Greens with Bacon. 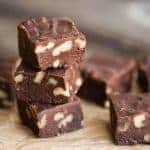 My mouth is seriously starting to water as I write this. 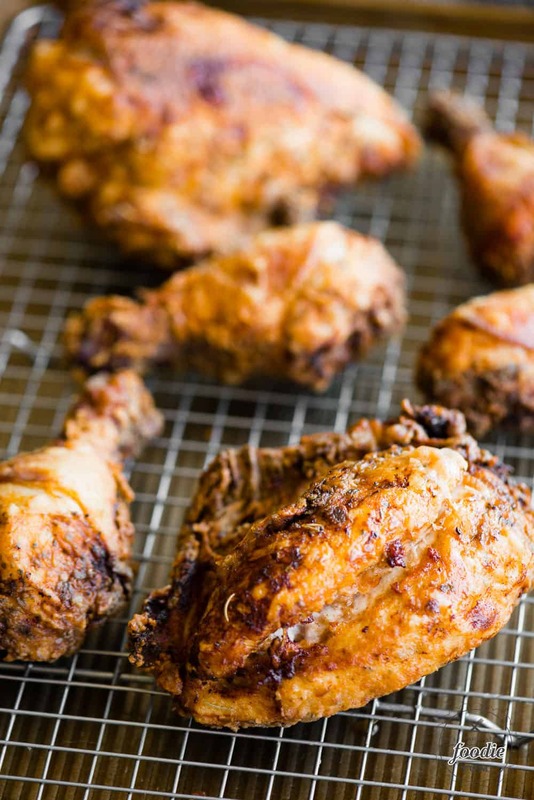 What chicken works best for buttermilk fried chicken? You can totally make boneless skinless buttermilk fried chicken, but it won’t turn out like the crispy-on-the-outside moist-and-tender-on-the-inside Southern fried chicken we all dream about. The skin not only helps keep the meat inside moist and prevents over cooking, but will get extra crispy on the outside when dropped in hot oil. When cooking chicken pieces that still have the bone inside, the cooking process will take longer but the chicken will be more moist and delicious. 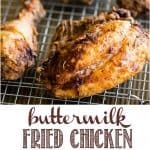 How do you make Buttermilk Fried Chicken? Buttermilk fried chicken is definitely a labor of love. It is not the kind of dinner recipe you can come home from work and have on the table thirty minutes later. If you’re looking for a quick and easy chicken dinner recipe, you’re better off making something like Perfect Cashew Chicken, Chicken Piccata, or Perfect Chicken Parmesan. 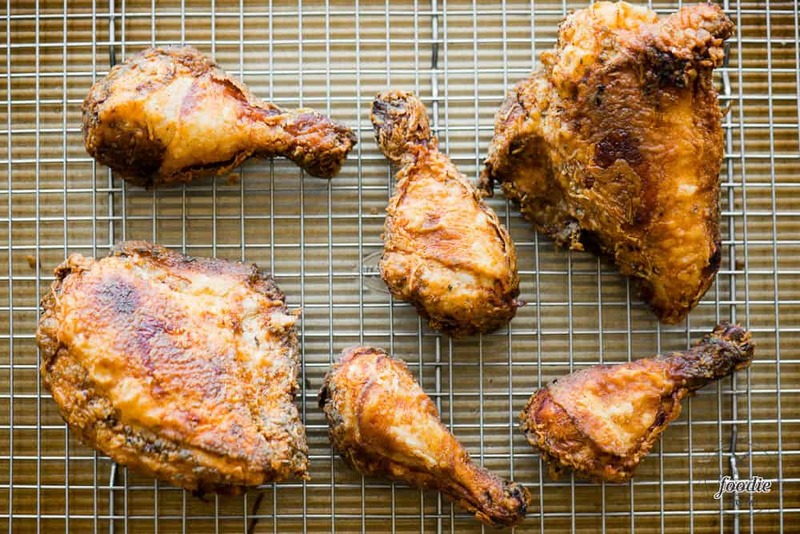 This Buttermilk Fried Chicken recipe involves soaking your bone in skin on chicken pieces in a seasoned buttermilk brine. Then coating them in a seasoned flour. Then frying the coated chicken pieces in a lot of oil. 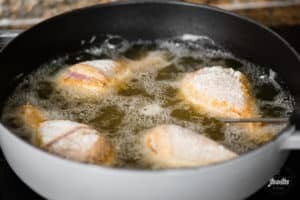 Deep frying used to scare me, but once you get the hang of it, there’s actually less splatter than if you’re cooking in a hot pan with just a bit of oil. A really good quality cast iron pan works really well for deep frying chicken. 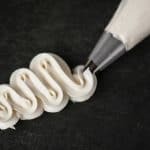 A trusty thermometer is also one of those kitchen tools that’s necessary for making this recipe. Buttermilk is acidic. In fact, if you don’t have buttermilk on hand, you can make a buttermilk substitute by combining 1 cup of milk with either 1 tablespoon of white vinegar or 1 tablespoon of lemon juice. Both the vinegar and lemon juice are highly acidic. The acidic dairy helps tenderize the meat. Buttermilk adds a bit of flavor. It also helps the chicken absorb any spices you include in your soak. Finally, after a long soak in buttermilk, the seasoned flour coating will be able to stick to your chicken prior to coating. This, combined with the cooked skin, will give you that crispy flavorful outside. 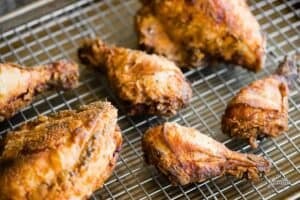 How long do you soak chicken in buttermilk before frying? My recommendation is to soak your chicken pieces for at least 6 hours. You need to give the buttermilk enough time to break down and tenderize the chicken. If you’re a planner, a good buttermilk brine soak overnight will only make your chicken pieces even more tender. I, on the other hand, often don’t know what I’m making for dinner until the night of. 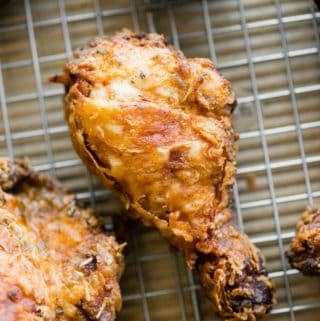 Buttermilk Fried Chicken is the ultimate comfort food! Bone in, skin on chicken is soaked in a buttermilk brine, coated, and fried until golden and crispy! Definitely the ultimate comfort food! I love that I can make it at home easily and that it turns out so good! Whenever I think of Southern cooking, this is what I think about. SO GOOD.